With Web Toolbar, you’ll be searching web pages faster than ever. Web Toolbar is one of the newest applications by Mobato, whom we’ve seen here on the CrackBerry blogs before. With Web Toolbar you can quickly perform searches of the Internet’s most popular search engines (including IMDB, YouTube and more) from your home screen. Without Web Toolbar, you have to launch the browser, click/tap in the search bar, type your search and then wait for the results. Now with Web Toolbar, you can reduce time and energy (yeah I know it’s not a whole lot to type and click but hey every little bit helps!) by simply typing your search from your home screen and click the icon for your favorite search engine. Universal Search integration: For the best results, start typing on the device home screen as normal and the Web Toolbar icon will appear, giving you the option to quickly perform a search (this option only available for OS 6.0 and above). Launch a search from the Web Toolbar menu item (accessible in most applications). Assign Web Toolbar to a convenience key to quickly launch a search. Web Toolbar will remember the last search term, so you don’t have to keep re-entering it for repeated searches. This option can easily be disabled should you want to. You can download Mobato’s Web Toolbar and give it a try for FREE for 7 days. If you love it, upgrade to the paid version for only $1.99. Head on over to the forum thread here to ask the developer your questions, make suggestions or comment on the app (feel free to leave comments below too). 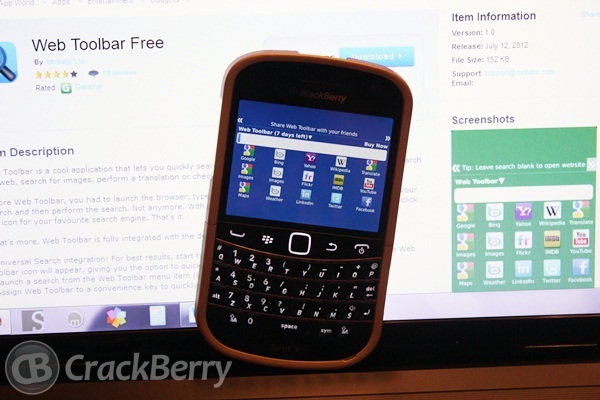 Web Toolbar is available for most BlackBerry smartphones in most countries that are running OS 5.0 and higher.